Well guys, right now I am currently hurtling through the sky in a tin can on my way to New York! By this time I will have been in the air only about 4 hours, and I predict I will have finished The Historian, by Elizabeth Kostava my latest read. I’m a passionate reader, and read anything I can get my hands on. My trips to the library always see me take home a dozen books and I am ravenous once I get started. I love novels, biographies, short stories, newspapers, op-eds and blogs. Like I said - anything I can get my hands on. I genuinely believe that one of the greatest gifts my parents gave me is a love of literature. They were both passionate readers, and it is a love I’m thrilled to see my son share. I love to read in bed. Laid out with cushions, a bottle of water and my books is my idea of pure indulgence. Second to that, I like reading outside – at a park or at the beach. Though I’m prone to people watching and daydreaming, so my best reading happens in bed. Unlike just about everyone I know, I hate reading in the bath tub. I do judge a book by it’s cover, but not in the way you’d think. The truth is, I hate reading hardcovers. I find cracking the spine and reading a paperback to be far more relaxing (and more conducive to reading while laying down, they are lighter). In a bookstore though, I confess a good cover will often catch my eye and make me pick up a book. Having said that, my favourite book cover is the cover of my edition of Black Beauty that my mother gave me when I was 10. It is an embossed hardcover in a deep red and the illustrations (both on the cover and throughout the book) are simply stunning. I can still trace my fingers over it (as I am doing now) and be taken back to that day when she handed me my first hardcover editions of Black Beauty and the What Katy Did series. They both still take pride of place in my bookcase. 1. Anne of Green Gables – L.M.Montgomery. This book holds such nostalgic value to me. It is not the first book I fell in love with (Enid Blyton holds that title), but it is the first book where I fell in love with characters. I fell in love with Anne and Gilbert, Marilla and Matthew. I was inspired by Anne’s love of learning and for the first time felt the desire to be the ‘smart’ girl. In years to follow, Anne with an E inspired me to work harder and be proud of my brain. 2. Little Women – Louisa May Alcott. Another book of my girlhood. Jo March made me want to be a writer. It is she who first nurtured my love of the quill, and who still drives me to want to one day write something truly wonderful. 3. 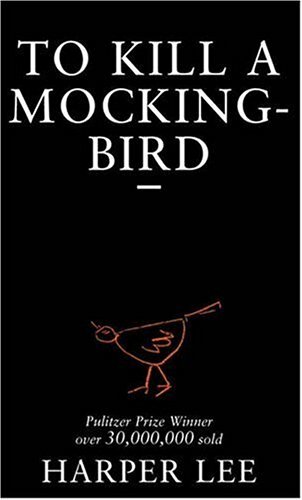 To Kill a Mockingbird – Harper Lee. My favourite of all of the ‘required reading’ novels from High School. Atticus Finch had such an impact on me – my first realisation of just how important social justice and standing up for what I believe in. He taught me about great oratory, and how the right words (combined with works) could change lives. 4. Pride and Prejudice – Jane Austen. I’ve long waxed lyrical about how much I love this book. My ultimate ‘comfort’ read, I indulge at least twice every year. Elizabeth Bennet is my second favourite literary character ever (after Anne Shirley). She appeals to that part of me that wanted to find a man I could not only respect, but was my intellectual equal. She is sassy and clever and funny and I heart her. 5. Enders Game – Orson Scott Card. On a completely different track to my other 4. This is by far the best science fiction book I’ve ever read. It is the first one I ever liked (my previous encounters with that genre left me cold). A fascinating story about a young boy, taken from his home to an exclusive ‘battle’ school, this story is heart warming and has an important lesson for us all, as all good books must. It spawned a series of sequels and spin offs, but this book stands alone in it’s brilliance. I love Anne too! I admired Atticus so much too, I also felt a strong connection to Jem and Scout, I felt that they, along with Dill, embodied what childhood should be like. Great picks!